They’ve been talking about putting a Picc line in for the last few days. This morning they made 3 attempts to put the Picc in, but were unsuccessful because veins in heart defect babies sometimes can be a bit difficult/different. Also, the insertion points were flat shaped veins. On attempt #4, it finally worked. 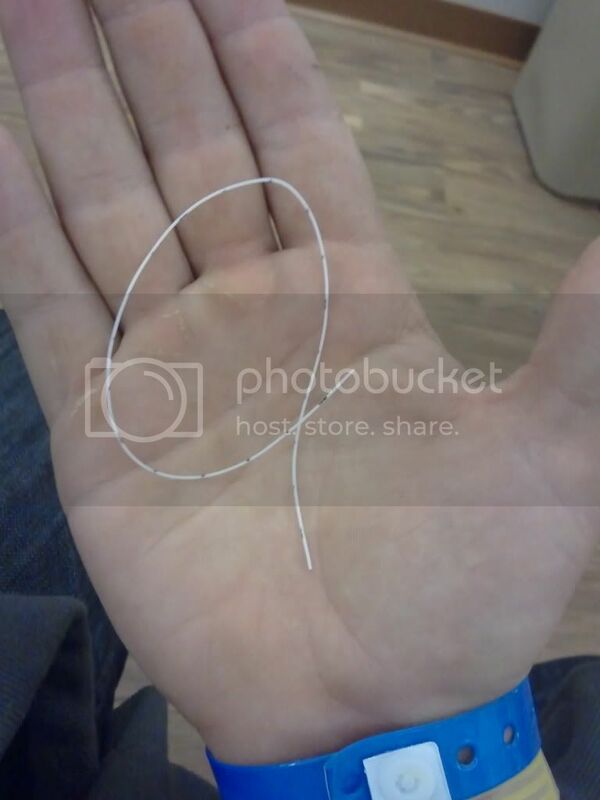 Below is a piece of the tube that was inserted. Jane pretty much had a stable day, which is not a great thing, but definately not bad. HUGE NEWS: Our doctors are going to have a pow-wow meeting with a panel of doctors, cardiologists, and surgeons tomorrow. The intent is to do some mega brainstorming. The resident and fellow doctors will present Jane and her condition to the panel, where there will be a bunch of different opinions on whether to perform surgery, wait a week, install a balloon, catheterization, try different medications, change doses of current medications, etc. The decision will ultimately be left up to the few great doctors that are responsible for her progress, who have been caring for her since day one. I went all the way out to Whittier today, to the dentist, for a look at my toothache. I thought for sure I was going to need my wisdom teeth taken out right away (which I do eventually, so let me know if anyone has a good place). Turns out it’s a canker sore, and she told me it was caused by stress, and I can expect more to come. Wonderful. But atleast she said its not contageous. Elisabeth & me: today was rough emotionally. It’s just hard and wearing down. Its so hard to see my innocent newborn with dozens of tubes and cables, and hooked up to machines. I did get good words from people that have been in my shoes, and that’s one of the few things that really comforts me, even when they tell me, that when I can’t handle more pain, more pain will come. This passage was sent to me, and its exactly how I feel. “ 23 Awake, Lord! Why do you sleep? This was written and sent to me. Please pray this for us. I need it. Lord, let your mercy come down from the heavens like rain, and touch Daniel, Elisabeth and Jane. Do not let them continue in this grievous situation, but save them from this. Save them from this tragedy, save them from this misery. Grant them deliverance in this hour. Lord, forgive us of our sins and allow us to shine with your love and your glory. Let us be radiant with joy and gladness. Send your Holy Spirit to strengthen us, lift up our eyes so we do not despair, enliven our souls so we do not fall, bring us up off the ground so that we do not grieve. Send a healing spirit to work on Jane and give her whole being strength and power. Work on all of her organs so they promote her health in all ways. Strengthen her lungs, each little tube and sac, each artery and vein, so they can work more efficiently. Heal her heart, every artery and vein, every flap and chamber, so that it pumps blood properly, and let it be that she does not need the surgery. Lord, you are our healer. Heal Jane’s heart and lungs so they work perfectly. Fortify every cell in her body with your Holy Spirit that she may be rejuvenated. Let your presence be with her completely and let your healing come downs like rays of sunshine to warm her, strengthen her and enliven her. Guide the doctors in all of their thoughts and feelings, through all of their discussions and meetings. Let your wisdom guide them through everything they do for Jane. Give Daniel & Elisabeth an understanding of what needs to be done so they can be in agreement with the doctors and make the correct decisions. Give them an understanding of your plan, so that they turn away fear, and live in hope. Lord, hear them in their grief, guard them with your Holy name, the God of Jacob, the Eternal Creator, the All-Powerful, the Almighty, send them help from your sanctuary, surround them with our people, Zion itself. Send them people to support them and encourage them in this time. Remember all of their prayers, all of their sacrifices, all of their offerings. Give unto them unto their hearts desire, and make their plans succeed. We praise you for the deliverance you give, and we lift up your banner, the name of our God, in front of all people, and we proclaim your power, your might and your glory. Lord save us in this hour. Today was a hard day for us emotionally. There was a bunch of unsuccessful weaning of medications, as Jane responded with higher heart rate, as well as dismal blood measurements. Blood is qualified using a test called “blood-gas”, measuring the pH, Carbon dioxide, and 4 other numbers. They draw blood approximately 4 times per day for “blood-gas” tests. This is the reason right now for her current blood transfusions, because she can’t produce blood as fast as they’re drawing it from her. The nurse tonight had to remove one of Jane’s intravenous lines, which was run in her belly-button, 14 cm up towards her heart. The line began failing, so they decided to remove it rather than risk infection. The line came out without breaking ,which would have been a big problem. Thank God for that little plus for the day. However, the problem with this is that the respiratory therapist needs to draw Jane’s blood 4-6 times per day for “blood gas”, and now that she doesn’t have the UA line, they need to get it with a needle. I hate watching it. I was talking with cardiologists this morning about their ideas of a possible surgery, which they still want to wait and watch for a couple weeks. One of the possible procedures they are considering for Jane would need to be done by a heart surgeon specialist, that specializes in this specific surgery. This means CHOC would be putting us on a medical plane up to Stanford for this specialized surgery. This was just a thought brought up, we just HOPE it doesn’t happen. we really want to avoid/postpone surgery as long as possible. One of the doctors paid me and Jane a visit privately, giving me much needed reassurance, and letting me know that they are trying their hardest. Apparently we are giving them reassurance and are making their job easier just by showing we care so so so much about Jane. We were able to go out on a friday-night date, and it was a wonderful breather, just to get out, and try to take a brake from this mental drain. It was so hard leaving Jane though. And my mom got to babysit Jane for the first time. In other news, today is Mark Beliakoff’s 29th birthday. Happy bday and congrats on a huge engagement. Jane might get hooked up to a different respirator machine, called a (I forgot, oops). This new machine changes the breathing rhythm and pressure, and will hopefully help improve her “blood-gas” — remember I taught you yesterday about this? As I’m writing this, we just found out Little Jane has a little blood clot. Hematologist is coming in 40 minutes to make a plan. In the meatime, she’s going to get an ultrasound of her brain to see if there’s any clotting there. Today’s been anything but boring. We’re all packed up, waiting for the stanford air ambulance. They’re en route to John wayne airport from Sacramento. Supposedly this small baby surgeon at Stanford (Packard Children’s Hospital) is worldly recognized in this specialty surgery. Babies from around the country come here if they have this defect. We were told the success rate is 60/40. Elisabeth and I left from John Wayne Airport for Stanford at 740pm and arrived at the hospital at about 10pm after dropping off our luggage at Bill & Beth’s, a hospitable family that live about a mile from the hospital. It was obviously hard leaving Jane; I begged for atleast the mommy to get on the medical plane, but they said they just can’t accommodate more weight — I didn’t know Elisabeth weighs that much, hmm. We waited til about 11pm, while the new team got Jane’s equipment ready for when she arrived, to hook her up quickly. We were told that we’d be up here approx 2-3 months, but that’s no promise; it could be longer, could be shorter. Nonetheless, we’re looking today and tomorrow for a place to stay long-term. Tuesday is the scheduled first surgery. The team is going over the xrays and echos to formulate a gameplan. About an hour ago, a complete stranger brought me mexican food and $200. She’s a friend of a friend of a friend. I can’t believe the graciousness we’re receiving. This is just an example of the helpful/heartful people trying to lighten our load. Super-sized thank you. Jane’s going in at 7am. Surgery 6-8 hours. More detals to come latr, but I’m off to a nap. Everyone, I’m so so very extremely fortunate to experience the love and support you’ve shown us. This is the most difficult time I can imagine, more pain I can imagine. I must say for the first time since Elisabeth went in for C-Section, I’m at ease, I’ve been a huge mess. But it was like a light switch turned on yesterday evening. I can only say that God’s with us. Jane will be out of surgery around 2-4pm. Not out of the woods, yet. Surgery went well yesterday as far as the heart’s concerned. Dr. Reddy (surgeon) was smiling, and if he’s happy, then they were all telling us that means the surgery went well. They also said Jane’s little heart was stronger than they expected. However, her R lung was bleeding after surgery, and they’ve since been able to stop the bleeding after a few scary moments. But as it is now, they need to get her on blood thinners (aspirin) to prevent clotting in her new shunt, which is a big concern for them right now. If clotting occurs, there’s a new surgery in store for our little warrior. They are watching her very closely day and night to make sure she’s stable. That means they are taking blood-gas samples hourly, watching her vitals closely (oxygen saturation, urination, blood pressure, and DOZENS more); anything they can do to be on top of an event before it happens. So she has lots of machines monitoring, and tubes connected to her everywhere. On a good note, her lungs are working rather well, too well in fact. Machines are still breating for her, cuz she’s paralyzed (medically induced) and heavily sedated. BUT, the machines are pumping regular air without additional oxygen or NO. They’re going to slowly reduce the paralyzing drug to see if she starts breathing a few extra breaths on her own. God blow that air in her lungs. A few people asked if blood donations are still needed. The answer is YES. Jane has what she needs for right now, and they won’t send us blood for her all the way up to Northern Cal. But there are other newborns and children at CHOC that do need donators. So if you do have 15 minutes, you’d be helping someone else tremendously. Plus, you’ll get a cookIe. Jane: post-op is still a bit shaky. 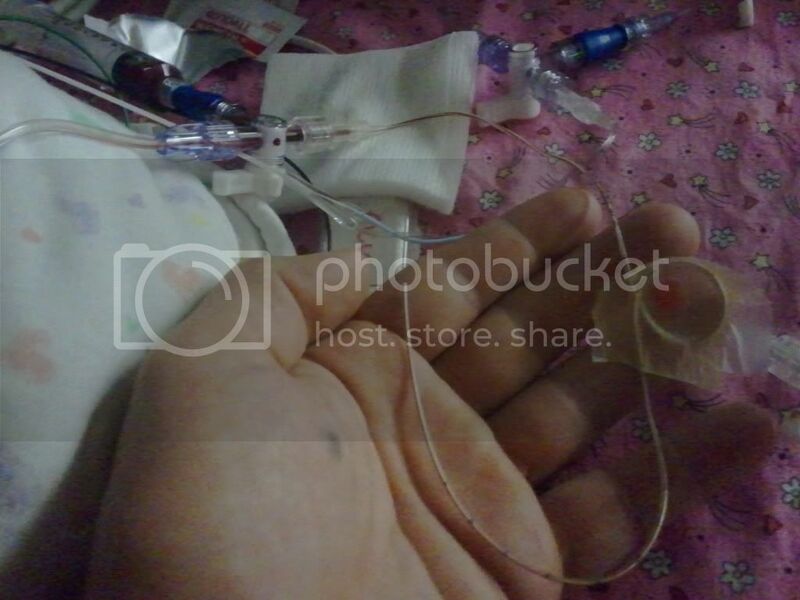 Her heart rate is high, kidneys and liver are a concern, and she’s not getting rid of her fluids, so she’s very swollen. Her blood pressure is a bit high also. So tonight they got her back on pain sedatives, because some of these symptoms might indicate discomfort. Probably true, she just had life-saving surgery. Good news is doctors did warn us of probable instability for first 72 hours after surgery, maybe even longer, since Jane IS very small and very sick. They told us a couple times that she’s one of the most critical, if not THE most critical, out of all 158 youngsters. But the doctors are world-class, and God’s on our side, and I can take that all the way to the bank.